Every software is incomplete. There is always something to add and make it better. So is the case with wordpress. Thanks to the plugins and I can customize wordpress without much knowledge or no knowledge of coding. Some plugins allow you to turn wordpress into a full fledged gallery. You just need to upload and activate plugin. That’s it. Good thing with wordpress is, if any plugin goes wrong just delete it’s folder and your blog runs back normal. So why I am talking about plugins today? This is not a blogging blog or WordPress hack blog. For many days I was searching for a good plugin. A plugin that can list my watched movies on a page and it should be easy to update, edit, rate. But I am a movie buff and watch a lot of movies. I am too lazy to write review of a every movie I watch. This is Nonsense blog and not a movie review blog. Hence I wanted a plugin where I can write a short review, a link to movie page, ratings out of ten and possibly comments by user. I didn’t get the last option though. While doing a search I found a plugin that fulfills my needs. 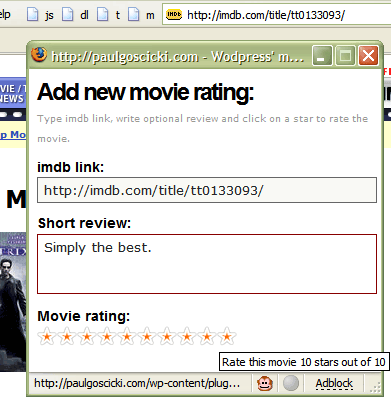 That plugin is WP Movie Ratings. I have just installed the plugin and testing it. That is why I am not giving out the link for the movies page. I also have to update that page with some movies. This plugin will free me from posting reviews of movie unless I find it too good or too bad to watch. I don’t like to use many plugins with any software. They slow down the performance of core software. I couldn’t resist this one. I crossed the ten plugin mark with this plugin. Now I use a total of eleven plugins. It’s difficult to remove any one of these. How many plugins do you use?? Hot rattling, looking fairly useful friend.